My response was half sarcastic, but in the latest pic the park posted, the roof is still not done. 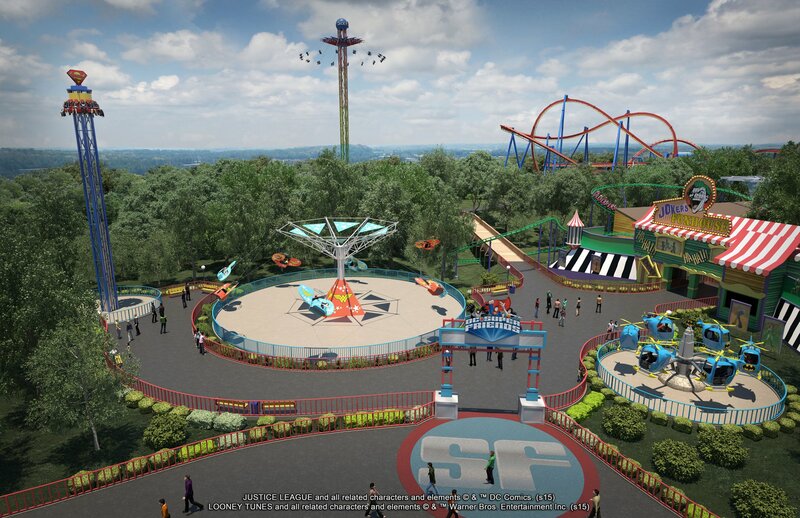 In other news SF Mexico has ride system components and the first stages of themeing installed. FParker185 wrote: My response was half sarcastic, but in the latest pic the park posted, the roof is still not done. In other news SF Mexico has ride system components and the first stages of themeing installed. I'm just asking a question so please don't shoot me, but what happens when the Batman V. Superman comes and goes, and then the Justice League movie comes and goes; would it be responsible of the park to keep this ride or should they try and upgrade some how. I mean we had Space Shuttle America and we have TDK. SSA was at least able to change the video. TDK, was good until about 2010/2011 now the novelty is wearing off and even kids don't want to ride it anymore. Do you think JLBFM is going to run into the same problems? Can they change themeing of the ride, or would it be a complete demo? Do you think if it runs into these problems they could turn it into a permanent haunted house for the season or just FF? Did any of you visit Maison Rouge @ La Ronde if yes how was it?? Viper 88 wrote: I'm just asking a question so please don't shoot me, but what happens when the Batman V. Superman comes and goes, and then the Justice League movie comes and goes; would it be responsible of the park to keep this ride or should they try and upgrade some how. I mean we had Space Shuttle America and we have TDK. SSA was at least able to change the video. TDK, was good until about 2010/2011 now the novelty is wearing off and even kids don't want to ride it anymore. Do you think JLBFM is going to run into the same problems? Can they change themeing of the ride, or would it be a complete demo? Do you think if it runs into these problems they could turn it into a permanent haunted house for the season or just FF? Did any of you visit Maison Rouge @ La Ronde if yes how was it?? Superheroes will always be popular. Batman was built almost 25 years ago and that's still popular. SSA was just changing the film and movement of the seats in the theater. To retheme JL would be far more expensive and difficult to change. Justice League isn't just a movie, it's a franchise. Like said above, Batman was built in 1991 and is still getting and hour+ lines. I wouldn't worry too much about it. I know its also a franchise, but compared to BTR, I just don't see it with staying power BTR has other things going for it 1 first outside looping coaster and 2 ACE landmark status. ^You need to think in the eyes of the GP. When they go to a park, they don't care one bit about an ACE landmark. They do care about it being Batman, however. So if a ride features Batman, Superman, AND all of the DC heroes, then they'll be very interested. I think Justice League will be popular for the long run. I can totally see myself riding it at least once a trip trying to get a higher score then everybody I'm with. Especially my dad, he always has a higher score than me on a ride like the Toy Story shooting ride or Gobbler Getaway at Holiday World. It's nice to get a shooting dark ride at my home park and the general public, especially families, will flock to it for years to come hopefully. There isn't really room there for much else, is there? I mean two smaller family flats, not a huge area. Was Anyone at no coaster con? anewman35 wrote: There isn't really room there for much else, is there? I could see some flying scooners across the way by the service entrance. JaminOut wrote: I mean two smaller family flats, not a huge area. ^What did they talk about? Or maybe a small drop tower like in the picture that got posted. That would be kind of close to giant drop though. I wouldn't mind a small drop tall it just seems kind of odd to put two drop towers right next to each other. I'd prefer that Joker Funhouse walk through. Anyone at No Coaster Con get info on "Enhanced Lex Luthor Scene"?